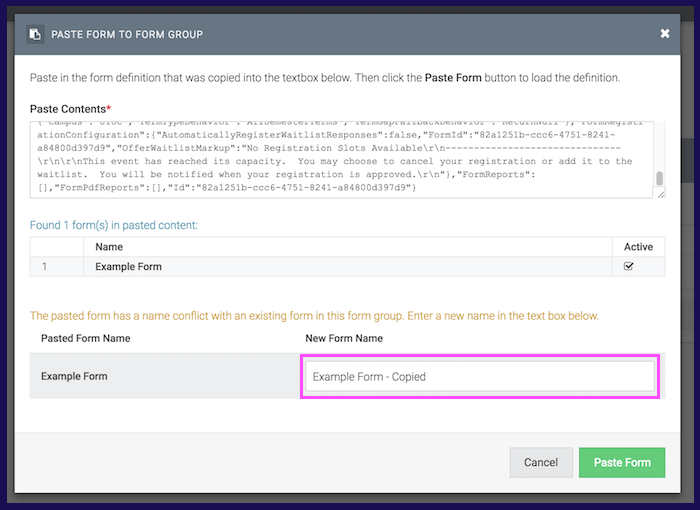 This tutorial provides a step-by-step guide of how to make a copy of a form. 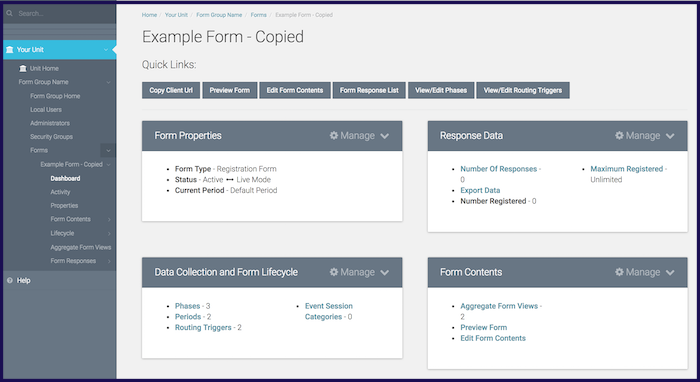 Copying a form can be used to back up the progress you have made or to create a new version of a form while keeping the old version saved. This process can also be used to move a form over from the test server to the production server. 1.) From the form group page, select the blue gear on the form you want to duplicate to open the drop-down menu of options. 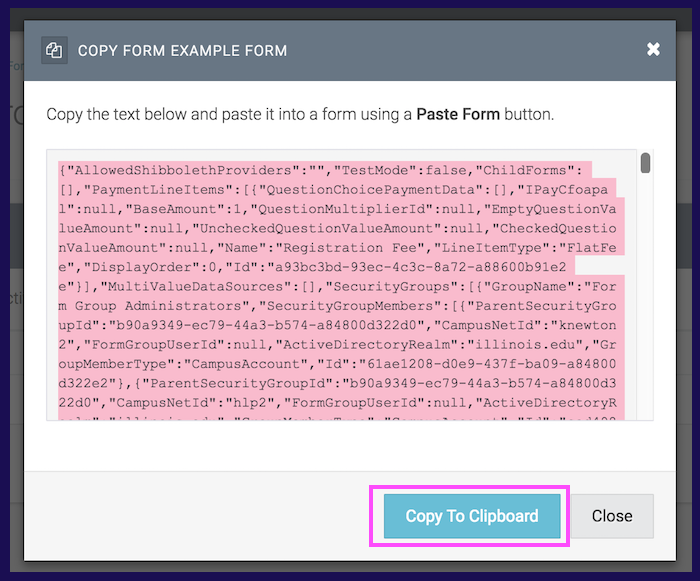 Select 'Copy form to clipboard'. 2.) A new window with a box of highlighted text will pop up. Copy the text using the blue 'Copy to Clipboard' button. Once the text has been successfully copied, you will see a small black notification above the button and you can exit out of the small window. 3.) 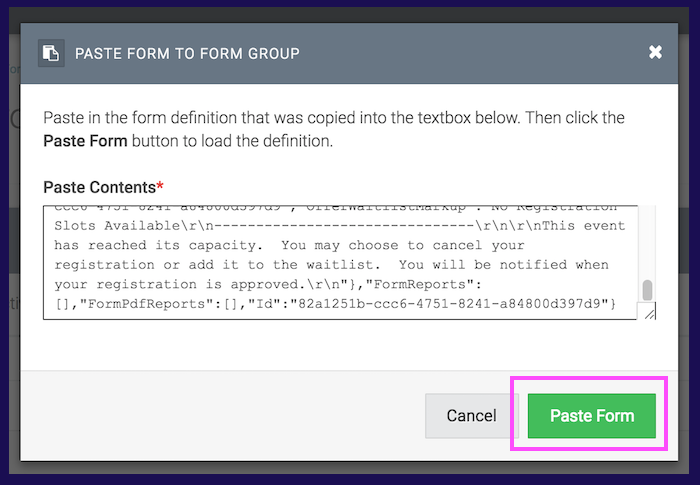 Select 'Paste a Copied Form' back on the Forms page. 4.) This option will open another window with an empty text box. Paste the copied text into the text box (Ctrl +V) and select the green 'Paste Form' button at the bottom of the window. 5.) You will be prompted to rename this new copy of the form, or you may keep the auto-generated 'Your Form Name - Copied' title. Select 'Paste Form' once more. 6.) This will bring you to the Dashboard of your newly created copy. You can make edits or changes here that will remain separate from the original form. For more information like this, check out: ATLAS FormBuilder - How to Copy and Paste a Question and ATLAS FormBuilder - How to copy a security group.